My first skateboard was a yellow fiberglass deck from skating pioneer Tunnel. Then I moved on to wood, but in between I rode the occasional plastic board. They weren’t made for ramps or street skating given their extra flex, but they were great cruising boards for rolling down the sidewalk or making a run to 7-11. So I enjoyed seeing 3Ders’ post on Sam Abbot’s design for a 3D printed skateboard. It was printed with what looks likes SLS. Sam won a design competition hosted by CGTrader and 3D Print UK last month the design. His prize was a 3D printer and a print of his skateboard design. 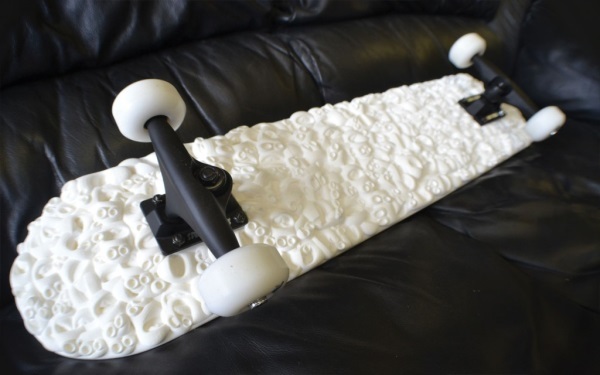 3D Print UK calls it the world’s first 3D printed skateboard. Given its size, the board had to be printed in three pieces and put together with dowels. I’m guessing the board has a lot of flex like my boards of old so it probably would’t work for airdrops and stair jumps, but it sure looks cool. I love the weird, bubble eye faces on the bottom of the deck, but they would make rail slides and any tricks using the bottom of the board a little bumpy. Best to use this board for Slurpee runs. I’d love one of these to get around Maker Faire New York before the gates open.